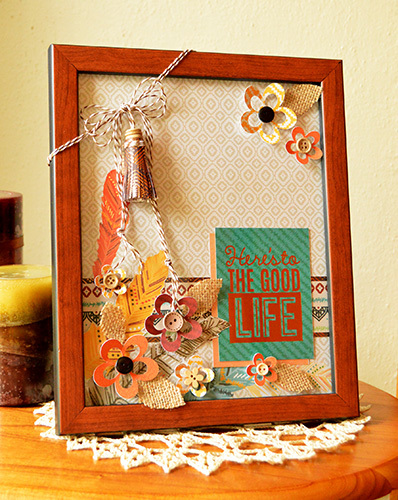 Decorate your home with this lovely boho style frame! Cut decorative paper 8”x 1.5” and Darker paper 8”x 1.75” and layer together. Cut around feathers on base paper with a craft knife so the decorative strip of paper can slide behind the feathers. Adhere decorative strip of paper in place. Trim sentiment from one of the sheets in the Boho Style stack and layer with a different contrasting sentiment rectangle of the same size. Adhere to the base paper. Position in an 8”x10” frame. Die cut flower (or cut by hand) in various sizes and colors and adhere to the front of the glass with glue dots. 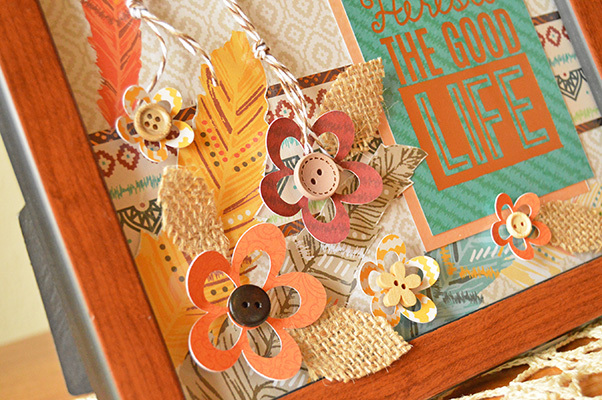 Add wooden buttons to the centers of the flowers and cut leaves from burlap and add those with glue dots to the glass as well. Tie twine around the top left corner and secure with glue dots on the back of the frame. 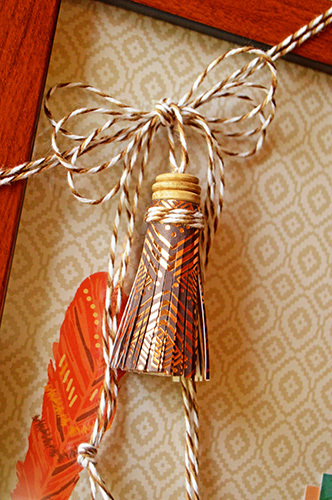 Create a tassel to hang from the twine bow by cutting a 1.75”x12” strip of paper and cut along the bottom edge every 1/16”. Leave ¼” of paper uncut along the top edge of the paper. Place red line tape along the top, uncut edge of the strip and roll paper into a tight coil. Glue three wooden buttons on top, and hang with twine. This look is awesome for decorating during the fall! Want a different style? Check out the selection we have!